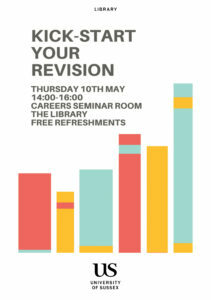 It’s that time of year again… join us to kick-start your revision! Grab a desk, learn about the time management pomodoro technique, and then the study space is all yours to start revising like a pro! Will I go thirsty? No, refreshments will be provided! Do I need to register? Nope, just pop along when you can make it!